Fall migration continued to be slow during the second half of August as warm south winds discouraged migration. The majority of birds banded continued to be Common Grackles and House Wrens, most likely local birds who were hatched or had nested on the island, but activity began to pick up towards the end of the month. New warbler species for the season continued to arrive, with the first Magnolia Warblers, Chestnut-sided Warblers, and Ovenbirds observed on August 19th, the first Black-Throated Blue Warbler on August 25th, and the first Golden-Winged Warbler on August 29th. Very often, mixed flocks of warblers were observed in and around the netting area, but the birds were flying too high up in the canopy to be caught in the mist-nets. After the winds turned to the north on the 23rd, the number of warblers began to increase, culminating in 17 birds banded on August 30th, nine of them American Redstarts. 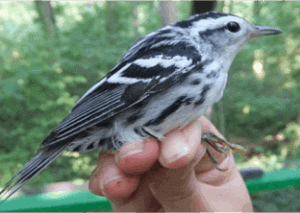 On August 28th, onlookers at the banding station noticed a large concentration of songbirds in a distant tree. Closer observation revealed that the assorted Baltimore Orioles, Red-Eyed Vireos, and various warbler species were all clustered around a single Common Nighthawk roosting on a branch. Small songbirds frequently mob owls and raptor species by giving alarm calls and even physically attacking the predator, but in this case they showed no signs of alarm and eventually dispersed. It seems they just didn’t know what to make of such a strangely-shaped bird! Large numbers of Purple Martins and a variety of swallow species have been seen on census flocking together at the tip of Fish Point and at Fox Pond. Swallows are often seen ‘staging’ in the fall, when they collect together to feed, roost, and rest while on migration. Travelling in large mixed flocks is advantageous to swallows because it provides protection from predators; makes it easier for the birds to find the irregular swarms of insects they feed on; and allows young, inexperienced birds to follow older birds to food supplies, shelter, and traditional stopover sites during migration. The recent north winds also brought in our first thrush species for the season, with a Veery and a Swainson’s Thrush being banded on the 27th and 28th of August, respectively. Both of these species belong to the Catharus genus of thrushes, to which the majority of birds banded by PIBO belong. Their arrival on the island is a sign that busier days of banding are ahead! PIBO would like to send a special ‘thank you’ to Abbey and Eric Orosz for volunteering at the banding station this month!